Since most homes and buildings today have some sort of hard flooring like ceramic or stone floors that have grout lines, how to clean grout has become a question asked by almost every homeowner. Usually when this question is asked, the grout has become so soiled and embedded with dirt and grime, that it requires heavy-duty cleaning. This task is most likely going to be difficult and labor intensive for the homeowner. This article’s goal is to provide the residential homeowner with an option to actually cleaning their grout and ceramic floors so well, they will look brand new. We have witnessed the process and it is relatively simple and produces superior cleaning results but the cost of the equipment is prohibited for homeowners to purchase this piece of specialty cleaning equipment. This equipment is a high pressure process that is an incredible way to deep clean grout and for that matter the ceramic or stone floor. This process not only addresses the residential homeowner asking the question of “How to Clean Grout?” but this same question is asked by Commercial Facility Managers. As stated, this article is written to support our residential homeowners but this same information can also be used to support and assist commercial end-user customers. As explained above, it can be difficult and most methods are labor intensive and that do not deliver positive results. We have published several articles on how to clean grout which covered various topics like deep cleaning, daily cleaning and stain removal of grout and ceramic floor tiles, etc. To that end, we recommend the hiring of a professional grout cleaning service contractor that employs High Pressure Grout cleaning machines similar to the Hydro-Force SX-12. The results are great and having a professional do the work will not only make your life easier but guarantee positive results without the need to make a costly investment in this cleaning equipment. 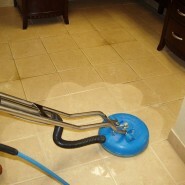 A high pressure water grout cleaning machine blows the soil and grime from the grout, ceramic or stone floors. It usually employs a rotary spray arm with two high pressure jet heads on each end of the rotary arm. The arm rotates spinning in a circle while the jet heads provides high pressure from 500 PSI to 2,000 PSI that blows and blast soils from the surface. The housing has a wet vacuum system that carries the water and cleaning solution into a recovery tank. It works with front-to-back and side-to-side motion. The following are some features that are common to all these types of machines. Sears Stores – Home Services are nationwide and uses this method of how to clean grout. See website below.